In my last post I explained why I ended up writing a personal manifesto. This is the first in a series of posts where I’ll share the content. Each piece is designed to fit into a cohesive whole, so I’m a tad nervous about posting in isolation, but hopefully the little bits carry some value on their own and add some value for your own deliberations on living well. If you’d prefer to get it all at once, you can download a pdf from the bottom of this page. If bite size is your preference, then to get a sense of where it’s going, here is the contents page. IN MY OLD AGE, assuming I am fortunate enough to get there, I’ll be reflecting back on my life and the memories will provoke deep reactions. The panoramic view of life in hindsight will distill the reality from the rhetoric I told myself along the way. I’ll see the consequences of my choices, all of which seemed to make sense at the time, but some of which I will wish I could re-visit. For a very long time I’ve been interested in understanding what constitutes a well lived life. What does it mean to be fully alive? Generally, I have had a good time of it: a loving, stable childhood, tons of opportunity, and some achievement. My mother is currently living with dementia, one of our daughters has a chronic disease, and one of our other kids has lost a partner in an air crash, each of which has shaped (and continues to shape) our little family significantly, but in the scheme of things we consider ourselves fortunate. Grace and luck: tick and tick. But there have also been choices; real choices that shape how life has gone. Occasionally there have been big calls (career, life partner, where to live etc), but for the most part living is defined by patterns of behaviour, patterns that are formed over time and that I perceive as part of who I am rather than choices I have made (what I do in my discretionary time, what I eat, how I exercise etc). I have come to realise that the quality of my living has had less to do with external realities and more to do with how I see and make sense of the world; my mental models. These notes are, in that sense, a mental model. They offer a framework to help me understand what the underlying realities are, for me, in what I believe will be a well lived life; it helps explain why my life seems to be going well in any given season (or not) and as a corollary offers me a diagnostic lens to determine what I can seek to change if I have a hunch that things are not quite right. My framework is not prescriptive. It is not about living a particular way, within a particular ideology or worldview. The framework is a set of design elements, things that I have discovered are true of my living in any context, with whatever ‘attribute hand’ I have been dealt, if I am to be fully myself, living life to the full and making choices that ensure I don’t look back on my life with regret. The framework helps me develop a meaningful response to the question, “What kind of life have I lived so far?” and also provides a lens through which to evaluate smaller chunks of time (the seasons of life). There already exist some ways to describe elements of being ‘fully alive’, (such as mojo & flow), but I haven’t come across a single word to describe, with nuance, what I have developed here, so I have chosen to use ‘generative living’. These notes explain how I get there, and why this word has been valuable for me in figuring out better ways to live. This is a personal manifesto. I am an educated, urban living, professional with a family. I am under no illusion that my notes here are applicable across cultures and contexts, or even for other people, although my suspicion is that those living in a similar environment might identify with some of my ideas. four enabling disciplines; getting & staying unstuck, being uncluttered, modal living and contentment. 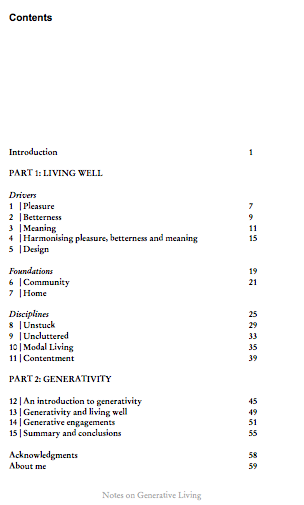 The second part introduces the idea of generativity; what it is and how it is a helpful frame applied to the earlier notes on living well. 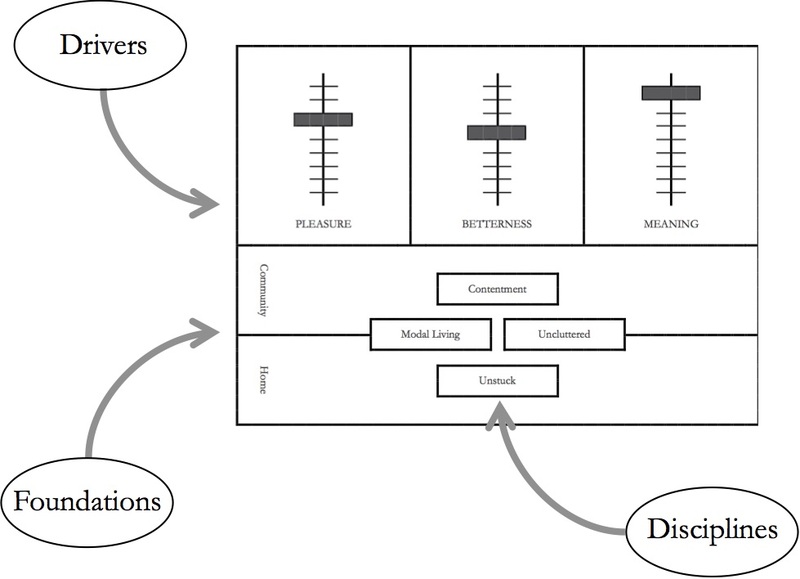 Next post: pleasure: engaging beauty.